In research of new materials for making jewelery beautiful, durable and innovative we met on our way a young Piedmontese company who perfectly fits our style sports, but especially the Made in Italy. After making due consideration and seeing to have different goals and points in common we decided to join forces and embark on a journey together to the creation of several lines of jewelry Carbon Fiber and Steel: now comes a New Partnership in the World Jewellery Sports between the two Italian companies and Piedmont CIRCUITI GIOIELLI e C6.0. 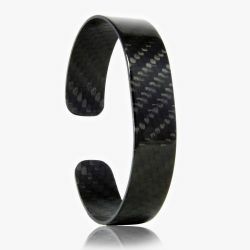 C6.0 transforms the idea of using carbon fiber committing in creating unconventional jewelry. The carbon fiber has a thin threadlike structure and made of carbon and its main features are the high mechanical strength, low density, the thermal insulation capacity, the resistance to temperature variations and the effect of chemical agents and good flame-retardant properties. The ergonomic bracelets are made using the best technology applied to carbon fiber, are resistant to all weather conditions and water-repellent. Beauty, lightness and elegance are qualities to which we aspire in the design of our products. The measurements of the bracelets are as follows: S (wrist circumference 16.5 cm) M (wrist circumference 17,5 cm) L (wrist circumference 18.5 cm). The Bracelet will be consign inner an elegant packaging contain the pamphlet of warranty with the informations about the jewel.